Stay local. Transportation is the most carbon-intensive component. Avoid destination weddings, and party where the majority of your friends and family live. Let nature reduce your electricity costs. Instead of lighting and air- conditioning a large venue, opt for the outdoors. You don’t need an ocean view: Explore nearby parks, gazebos and botanical gardens, and you’ll inevitably find the perfect spot. Embrace eco-fashion. Perhaps a handcrafted wooden ring or a vintage wedding dress fits your style? Moreover, instead of asking your bridesmaids to purchase matching dresses, pick a theme color and let them wear dresses they already have or purchase ones they’ll wear again. When it comes to food and flowers, think local and seasonal. When you plan your menu, favor plant-based dishes and pay attention to the serving style. Meghan Brightwater, Stanford’s sustainability coordinator, advocates reducing waste by serving food buffet-style so people take only as much as they want. For flowers, decrease your footprint by reducing your order, and, instead, decorate your tables with photos or other meaningful items you already have. Ultimately, your wedding should be fun, with a focus on the options that work best for you. I think the best way to do that is to celebrate sustainability at your eco-friendly wedding, to really flaunt it. Keep reading below for more advice on doing that, plus the details of my calculations. More than two million weddings take place every year in the United States. Although some couples choose to forgo a typical ceremony and celebration, most people still adhere to these traditions, which can rack up quite the carbon footprint. On the bright side, small, simple changes can make a wedding “greener” without breaking the bank or cutting back on any of the fun. How carbon-intensive is airplane travel? Airplane travel usually accounts for the majority of a wedding’s carbon footprint, so couples committed to an eco-friendly wedding should focus on choosing the location that requires the smallest amount of collective travel miles for all their guests. That being said, even when couples find their ideal location, a relatively small number of out-of-town guests can produce a significant environmental burden. My friend Kellie Wright, who planned her eco-friendly wedding in 2012, explains one way to deal with this problem: “My husband and I chose to get married in December because we knew many of our family members were already coming home for the holidays.” When couples plan their event around major holidays or family reunions, they not only make it easier and more affordable for guests to come, but they also significantly reduce the transportation emissions associated with their nuptials. 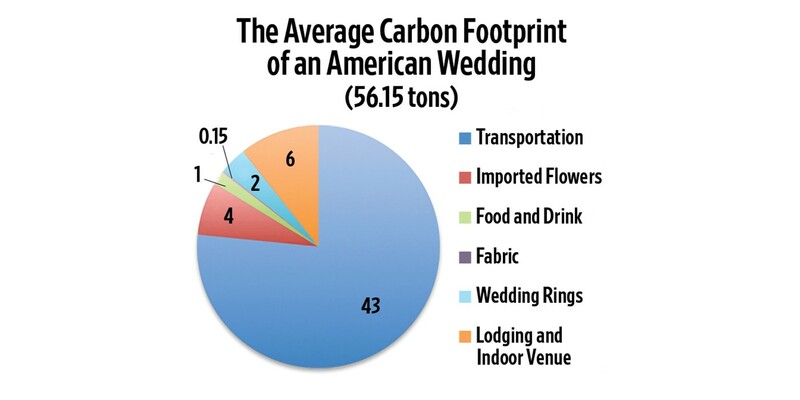 A number of factors can lower the environmental impact of your wedding meal. First, try to source your food locally to minimize transportation emissions. Second, and even more importantly, make sure your food is seasonal, as food grown locally in a greenhouse that needs to be lighted and heated is just as (or even more) carbon intensive than food transported from other parts of the country or world. Third, reduce meat consumption at your wedding to lower both carbon emissions and water use, and read this SAGE article to determine the varying impacts of specific animal products. In addition to consciously constructing your menu, make sure you have made arrangements to store or donate any leftover food to reduce waste. Just as with your food, focus on purchasing flowers that are local and seasonal, and read this SAGE article to learn more about sustainable flower sourcing. Even more importantly, however, consider simply reducing the number of flowers you order and finding other ways to decorate your tables and fill your bouquet. Eco-bride Kellie Wright suggests: “I filled half my bouquet with flowers and the rest with my grandma’s costume jewelry brooches. I like old things, and they were meaningful to me.” Wright was able to limit her consumption of one-time-use flowers, and, in the process, she further personalized her walk down the aisle. The last piece of advice is to celebrate sustainability at your eco-friendly wedding. In other words, if you are making the effort to green your wedding, why not flaunt it? You could create a green wedding registry or include an eco-friendly stamp on your invitations. You could even consider giving away wedding favors with an environmental message, like packets of wildflower seeds or sustainably sourced chocolate bars. In the process of planning and experiencing your green wedding, you may inspire some of your guests to plan their own eco-friendly events in the future. Riya Mehta, ’18, is an Earth Systems major.